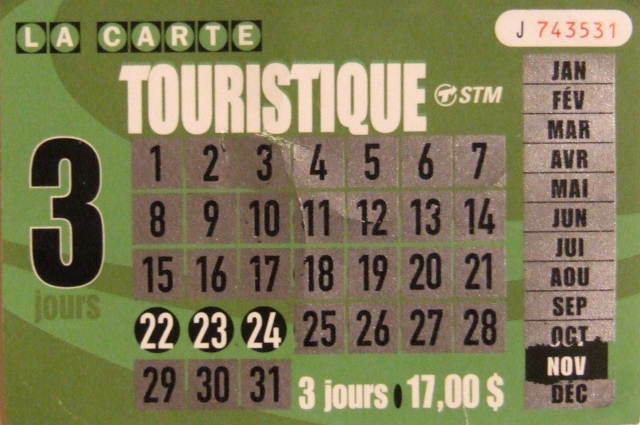 The old Montreal Metro's 3-day Tourist Pass, for use on the metro and bus. Note that this card cannot be used for the new stations now open in Laval, beyond Henri-Bourassa on the Orange line. This is no longer available since the OPUS card was introduced. When this was available, you would purchase a pass, mention the date you want the pass to start, and the ticket seller would scratch off the appropriate days. This pass does not allow for automatic entry through the turnstiles - to enter the metro, show the pass to the person in the ticket booth, who will then open the turnstile closest to the ticket booth.